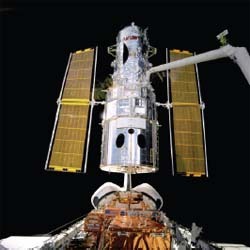 What happened to the Hubble Space Telescope after it was launched? After HST was launched and placed into orbit in 1990, initial tests showed that the telescope had several significant flaws. The solar panels jittered ever so slightly as the telescope orbited, blurring the images it took; worse, the primary mirror had been polished to the wrong shape. The result was an optical effect called spherical aberration in the images, which degraded the image quality by almost 90 percent. This was a tremendous blow to astronomers, who had been eagerly anticipating the clearest pictures of the universe ever taken up to that time.